The nondominant inferior parietal lobule is probably a major "store house" of artistic creativity. The ventromedial prefrontal lobe (VMPFL) is supposed to be involved in creative cognition and the dorsolateral prefrontal lobe (DLPFL) in creative output. The conceptual ventral and dorsal visual system pathways likely represent the inferior and superior longitudinal fasciculi. During artistic production, conceptualization is conceived in the VMPFL and the executive part is operated through the DLFPL. 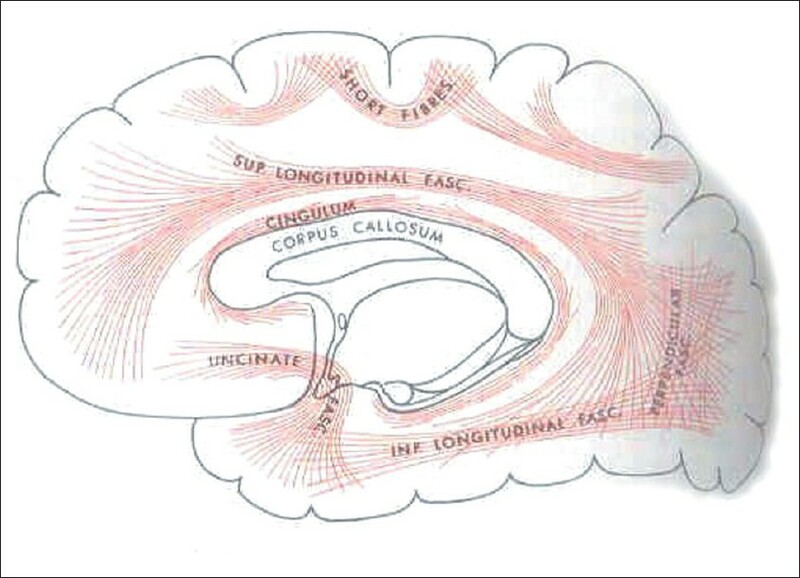 The latter transfers the concept to the visual brain through the superior longitudinal fasciculus (SLF), relaying on its path to the parietal cortex. The conceptualization at VMPFL is influenced by activity from the anterior temporal lobe through the uncinate fasciculus and limbic system pathways. The final visual image formed in the visual brain is subsequently transferred back to the DLPFL through the SLF and then handed over to the motor cortex for execution. During art appreciation, the image at the visual brain is transferred to the frontal lobe through the SLF and there it is matched with emotional and memory inputs from the anterior temporal lobe transmitted through the uncinate fasiculus. Beauty is perceived at the VMPFL and transferred through the uncinate fasciculus to the hippocampo-amygdaloid complex in the anterior temporal lobe. The limbic system (Papez circuit) is activated and emotion of appreciation is evoked. It is postulated that in practice the entire circuitry is activated simultaneously. This article is intended to give the reader guidance in evaluating different study designs used in medical research for better scientific quality, reliability and validity of their research. This article explains three main types of study designs with understanding examples. Care and caution with skills and experience needed to design suitable studies and appropriate design coupled with reliable sampling techniques and appropriate statistical analysis, supported by clear objectives with decent communication of the findings, are essential for good research. Primary and secondary generalized tonic-clonic seizures (GTCs) together constitute up to 50% of adolescent and adult patients with epilepsy as diagnosed by history and EEG. Syncope and psychogenic nonepileptic seizures are major differential diagnoses and must be carefully excluded in therapy-resistant cases. Individual episodes can have up to seven phases in secondarily generalized GTCs. The distinction between primary and secondary GTCs depends mainly on history and EEG, and yield can be improved with sleep deprivation or overnight recording. Epilepsies with primary or unclassified GTCs can respond to any one of the five broad-spectrum antiepileptic drugs (AEDs): valproate, lamotrigine, levetiracetam, topiramate and zonisamide. Unless a focal onset is clearly confirmed, a sodium-channel blocking AED should not be used in the initial treatment of these conditions. This article briefly outlines the proposed national epilepsy control program. The content of the article is based on four meetings held by invitation of the Ministry of Health. Invitees by ministry - Drs. D. C. Jain, M. Gourie Devi, V. Saxena, S. Jain, P. Satish. Chandra, M. Gupta, K. Bala, V. Puri, K. S. Anand, S. Gulati, S. Johri, P. S. Chandra, M. Behari, K. Radhakrishnan, D. Bachani. Presentations were made by Dr. M. Tripathi.The program will involve all neurologists across the country in teaching and training at state levels and a central monitoring committee. Introduction: Women with epilepsy (WWE) have an increased risk for several endocrine disorders. Obesity and Polycystic Ovarian Syndrome (PCOS) are common side-effects of anticonvulsant drugs. Aim: To study the prevalence of Obesity, PCOS, Thyroid dysfunction in WWE on monotherapy with Carbamazepine (CBZ), Sodium Valproate (VAL) and Phenytoin (DPH) Material and Methods: Sixty WWE in the reproductive age group (13 - 45 yr) who are on atleast 6 months of monotherapy with either CBZ (20) or VAL (20) or DPH (20) are subjects of the study. Their Anthropometric data is recorded. They are interviewed and investigated for PCOS and thyroid dysfunction. Twenty healthy women in the reproductive age group served as controls. BMI>25 is taken as cut-off for Obesity. PCOS is defined as menstrual irregularity and/or clinical /biochemical hyperandrogenism with ultrasound evidence of PCO as per the Rotterdam criteria. TSH <0.1 and >4 is taken as evidence of thyroid dysfunction. Women are grouped according to the anticonvulsant drug received and the data analyzed in each group. Results: The mean BMI among VAL and CBZ users is significantly higher than among DPH users (23.3 & 23.4 vs 20.4). There is no significant difference in incidence of PCOS among WWE using either DPH or VAL or CBZ. Elevated TSH>4 is seen more often in WWE on VAL (9/20) compared to CBZ (6/20) and DPH (3/20). WWE on CBZ, VAL and DPH did not differ in mean BMI, Obesity, PCOS compared to healthy controls. As compared to healthy controls, more WWE on drug therapy had significantly elevated TSH (1/20 vs20/60). Conclusions: WWE on VAL and CBZ had significant weight gain compared to DPH users. Despite weight gain, there was no difference in the incidence of PCOS between the users of VAL, CBZ and DPH. As compared to healthy controls, more WWE on drug therapy had significantly elevated TSH, more so in the VAL group. Background: Hirayama disease (HD) is benign focal amyotrophy of the distal upper limbs, often misdiagnosed as motor neuron disease. Routine magnetic resonance imaging (MRI) is often reported normal. Objective: To study the clinicoradiological profile of hand wasting in young males. Materials and Methods: Patients presenting with insidious-onset hand wasting from March 2008 to May 2011 were evaluated electrophysiologically. Cervical MRI in neutral position was done in 11 patients and flexion contrast imaging was done in 10 patients. Results: All patients were males less than 25 years of age, with median age 23 years, except one patient who was 50 years old. Duration of illness was 3 months to 3 years. All (100%) had oblique amyotrophy, four (36%) cold paresis, 10 (91%) minipolymyoclonus and three (27%) had fasciculations. Regional reflexes were variably absent. Two patients (18%) had brisk reflexes of lower limbs with flexor plantars. Electromyography (EMG) showed chronic denervation in the C7-T1 myotomes. 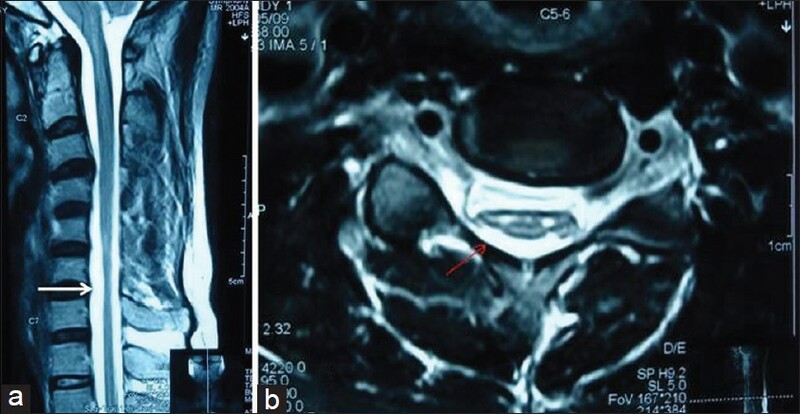 Neutral position MRI showed loss of cervical lordosis in 10/11 (91%), localized lower cervical cord atrophy in 9/11 (82%), asymmetric cord flattening in 11/11 (100%) and intramedullary hyperintensity in 2/11 (18%); flexion study showed loss of dural attachment, anterior displacement of dorsal dura, epidural flow voids in 9/10 (90%) and enhancing epidural crescent in 10/10 (100%). Clinical profile, imaging and electrophysiological findings of the patient aged 50 years will be described in detail as presentation at this age is exceptional. Collar therapy slowed progression in most cases. Conclusion: Clinical features of HD corroborated well with electrophysiological diagnosis of anterior horn cell disease of lower cervical cord. While dynamic contrast MRI is characteristic, routine studies have a high predictive value for diagnosis. Prompt diagnosis is important to institute early collar therapy. Background: Caring for stroke patients leads to caregiver (CG) strain. The aims of this study are to identify factors related to increased CG burden in stroke survivors in a census-defined population and to assess the relationship between patient characteristics and CG stress. Materials and Methods: In a prospective population-based study, 223 first ever stroke (FES) were identified over a 1-year period. At 28 days, 127 (56.9%) were alive and 79 (35%) died, and 17 were lost to follow-up. One hundred and eleven CGs of 127 FES survivors agreed to participate. The level of stress was assessed by two scales: Oberst Caregiving Burden Scale (OCBS) and the Caregivers Strain Index (CSI) in CGs of survivors with mild stroke Modified Rankin Scale (MRS 1-2) and in those with significant disability (MRS 3-5). Results: The mean age of CGs was 45.6 years, approximately 22 years younger than that of the patients (67.5 years). Eighty-nine (80%) of the CGs were females and only 22 (20%) were males. Urinary incontinence (P=0.000008), morbidity at 28 days by MRS (P=0.0051), female gender (P=0.0183) and moderate to severe neurological deficit by National Institute of Health Stroke Scale (NIHSS) on admission (P=0.0254) were factors in FES cases leading to major CGs stress. CG factors responsible for major stress were long caregiving hours (P≤0.000001), anxiety (P≤0.000001), disturbed night sleep ( P≤0.000001), financial stress (P=0.0000108), younger age (P=0.0021) and CGs being daughter-in-laws (P=0.012). Conclusion: Similar studies using uniform methodologies would help to identify factors responsible for major CG stress. Integrated stroke rehabilitation services should address CG issues to local situations and include practical training in simple nursing skills and counseling sessions to help reduce CG burden. Objective: The objective was to assess functional outcome of rehabilitation in chronic severe traumatic brain injury (TBI) in-patients. Setting: The study was performed at university tertiary research hospital. Study Design: A prospective cross-sectional study Materials and Methods: Forty patients (34 men) with mean age of 30.1 years (range 6--60, SD 10.8), severe TBI (Glasgow coma scale 3--8, duration of coma > 6 hours, post-traumatic amnesia> 1 day postinjury) were admitted in rehabilitation unit minimum 3 months (mean 7.7±4.6 months, range 3--22 months) following injury falling in Glasgow outcome scale (GOS) of 3. Functional recovery was assessed using the Barthel Index (BI) score and disability rating scores (DRS). Data Analysis: Paired Student's t-test was used for the assessment of functional recovery using mean BI scores at admission and discharge. 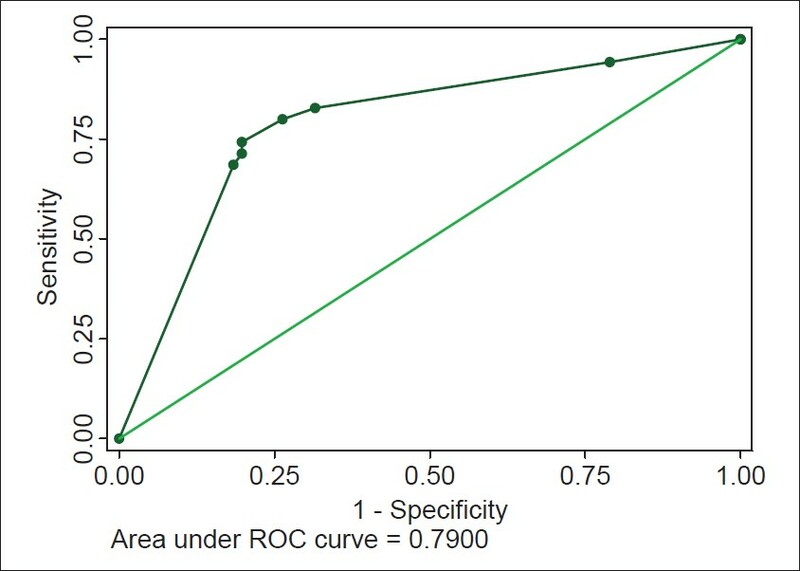 The Wilcoxon nonparametric test was used for the assessment of functional recovery by comparing admission and discharge DRS scores. Results: Mean duration of stay was 30.8 days (range 18--91, SD15.6). Significant functional recovery observed in patients comparing BI and DRS scores at admission and discharge (mean BI admission 50.5±25.4, range 0--85 vs. mean discharge BI score 61.1±25.3, range 0--95, P<0.001, mean DRS admission score 7.57±4.1, range 2.5--21.0 vs. mean discharge DRS score 6.36±4.3, range 1.0-21.0, P<0.001). Conclusion: Patients with severe TBI continue to show functional recovery even in chronic phase with rehabilitation. They are left with significant residual physical and cognitive deficits and would require long-term care and assistance from care givers for the daily activities, as suggested by the mean DRS score at discharge. Background: There is a lack of knowledge about epilepsy among the students and the population in general, with consequent prejudice and discrimination toward epileptic patients. Objectives: Knowledge, behavior, attitude and myth toward epilepsy among urban school children in Bareilly district was studied. Materials and Methods: A cross-sectional survey was conducted among students of 10 randomly selected secondary schools of the urban areas in Bareilly district. 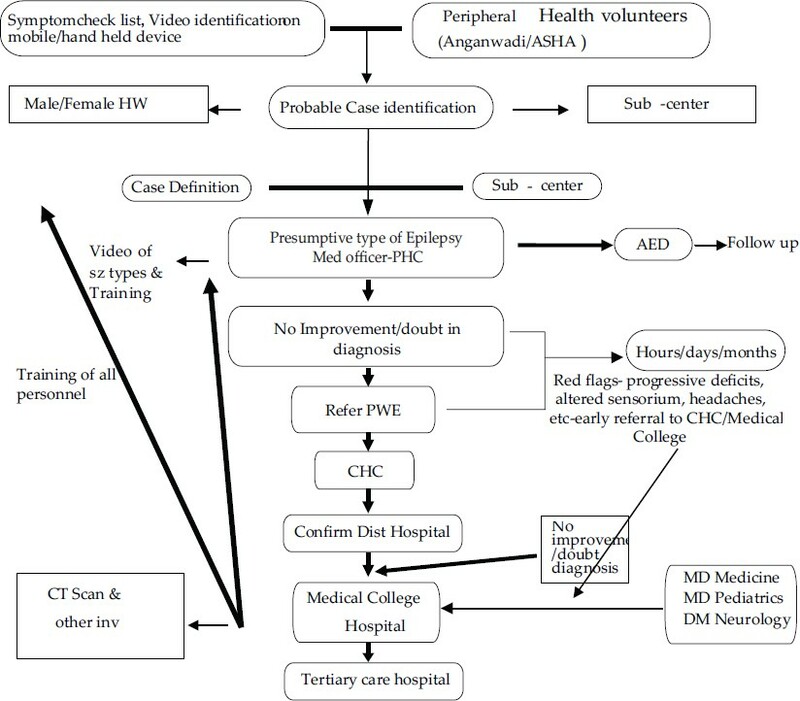 A structured, pretested questionnaire was used to collect data regarding sociodemographic characteristics and assess the subject's knowledge, behavior, attitude and myth toward epilepsy. Results: Of the 798 students (533 boys and 265 girls) studied, around 98.6% had heard of epilepsy. About 63.7% correctly thought that epilepsy is a brain disorder while 81.8% believed it to be a psychiatric disorder. Other prevalent misconceptions were that epilepsy is an inherited disorder (71.55%) and that the disease is transmitted by eating a nonvegetarian diet (49%). Most of them thought that epilepsy can be cured (69.3) and that an epileptic patient needs lifelong treatment (77.2). On witnessing a seizure, about 51.5% of the students would take the person to the hospital. Majority (72.31%) of the students thought that children with epilepsy should study in a special school. Conclusions: Although majority of the students had reasonable knowledge of epilepsy, myths and superstitions about the condition still prevail in a significant proportion of the urban school children. It may be worthwhile including awareness programs about epilepsy in school education to dispel misconceptions about epilepsy. The number of implanted vagal nerve stimulators is growing and the need for removal or revision of the devices will become even more frequent. A significant concern about Vagus Nerve Stimulation (VNS) therapy is the presence of the spiral stimulating electrodes, wrapped around the nerve, once treatment is considered ineffective or is no longer desired. Our purpose is to demonstrate the feasibility of complete removal and replacement of the vagal nerve stimulator electrodes using microsurgical technique even after a long period, without damaging the nerve. We attempted removal and replacement of spiral stimulating electrodes from a patient who received a 10-year long VNS therapy for drug-resistant epilepsy. Our results indicate that the spiral electrodes may be safely removed from the vagus nerve, even after several years. The reversibility of lead implantation may enhance the attractiveness of VNS therapy. 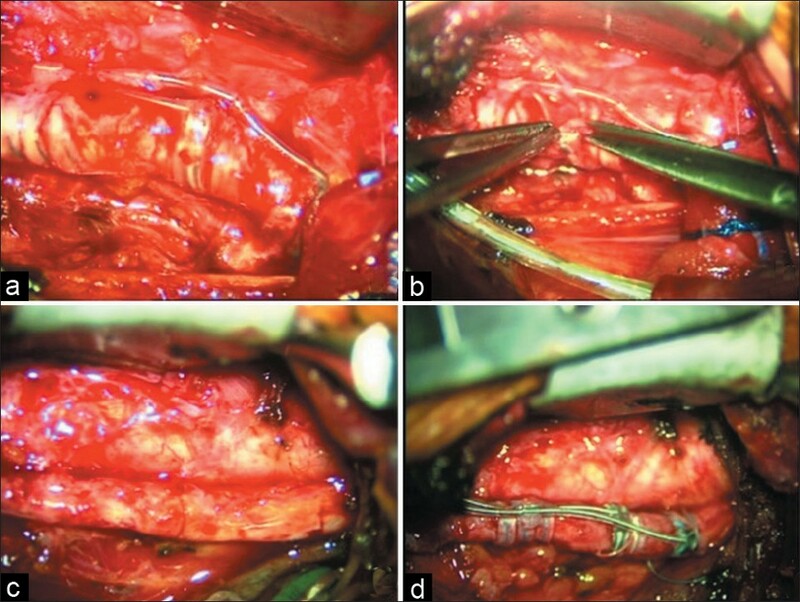 Furthermore, with a correct microsurgical technique, it is possible to respect the normal anatomy and functionality of vagal nerve and to reimplant a new VNS system with all its components, maintaining the same therapeutic efficacy after many years. Tuberculous brain abscess and subdural empyema are extremely rare manifestations of central nervous system tuberculosis. 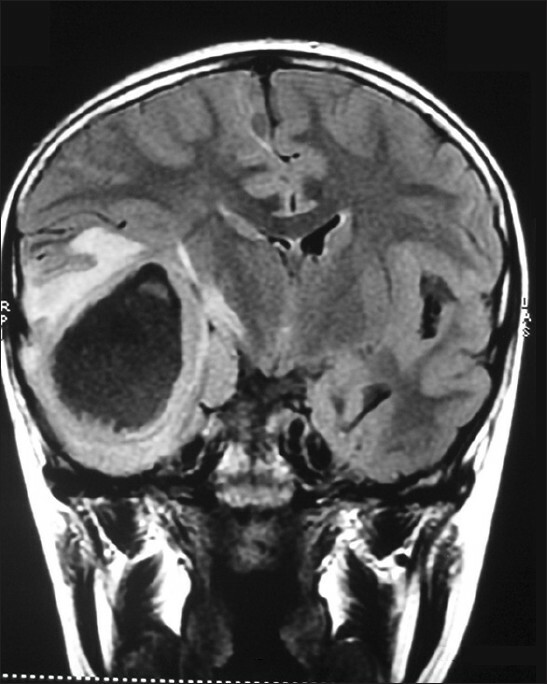 Here, we report a case of an 11-year-old immunocompetent child who developed temporal lobe abscess and subdural empyema following chronic otitis media. A right temporal craniotomy was performed and the abscess was excised. The Ziehl Nielsen staining of the aspirated pus from the temporal lobe abscess yielded acid fast bacilli. Prompt administration of antituberculous treatment resulted in complete recovery of the child. 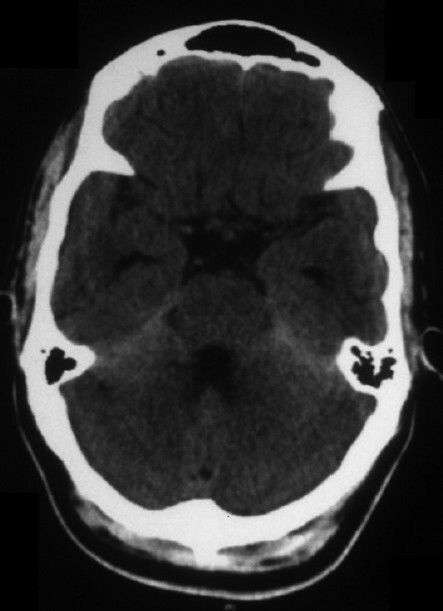 Even though the subdural abscess was not drained, we presume that to be of tubercular aetiology. Ours is probably the first case of brain abscess and subdural empyema due to Mycobacterium tuberculosis reported in the same child. This case is being reported because of its rarity and to stress the importance of routine staining for tubercle bacilli in all cases of brain abscess, especially in endemic areas, as it is difficult to differentiate tuberculous from pyogenic abscess clinically as well as histopathologically. Hereditary sensory autonomic neuropathy type IV (HSAN -IV), also known as congenital insensitivity to pain with anhidrosis, is a very rare condition that presents in infancy with anhidrosis, absence of pain sensation and self -mutilation. Developmental delay and mental retardation are usually present. Ultrastructural study of the peripheral nerves demonstrates loss of the unmyelinated and small myelinated fibers. We here report a 8 year -old boy with HSAN IV with typical clinical features where the diagnosis was supported by nerve biopsy findings. However, our case was unusual since mental development was normal. Neurological complications following honey bee sting are rare. We report a case of a 3-year-old girl who developed acute polyradiculoneuropathy following honey bee sting, which was diagnosed by nerve conduction studies. Khat chewing, though a tradition followed majorly in African countries, has of late spread widely across the globe due to faster transport systems and advanced preservation techniques. Many complications such as psychosis, arterial hypertension, angina pectoris, and myocardial infarction have been reported in connection to khat abuse. 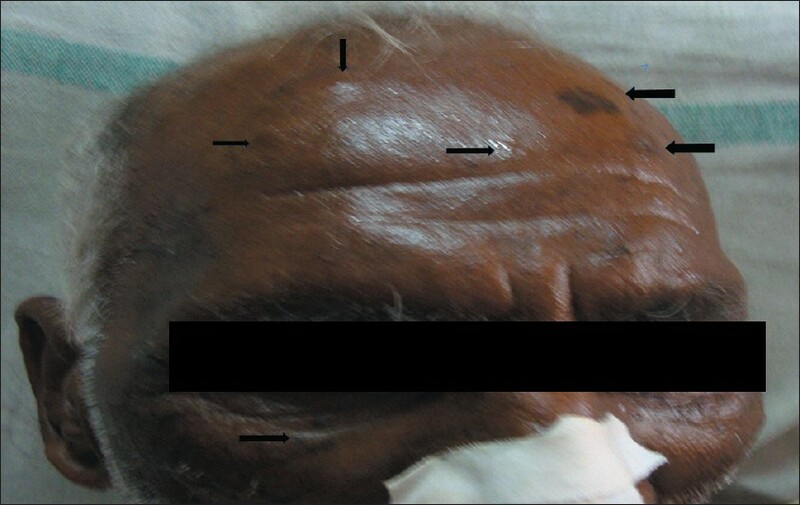 We present a case of a young man who presented with acute onset left-sided weakness. He was a known khat addict for over three decades. A diagnosis of left hemiplegia due to right middle cerebral artery infarction was established. Detailed evaluation revealed no significant underlying cause for stroke. Since the main central nervous system effects of khat are comparable with those of amphetamines and there are established reports of stroke in amphetamine abuse, the former was assumed to be the etiological factor. The patient was discontinued from taking khat and was managed conservatively. 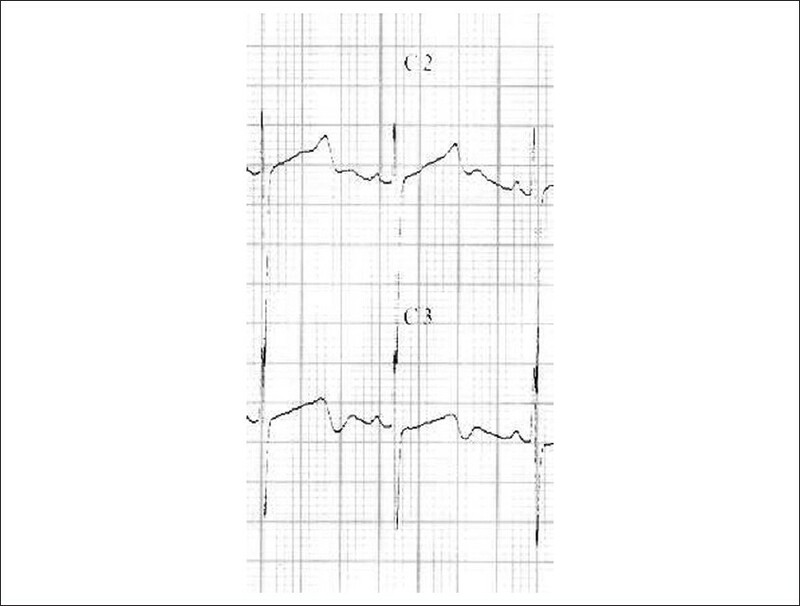 The subject showed significant recovery with no further complications or similar episodes during follow-up. 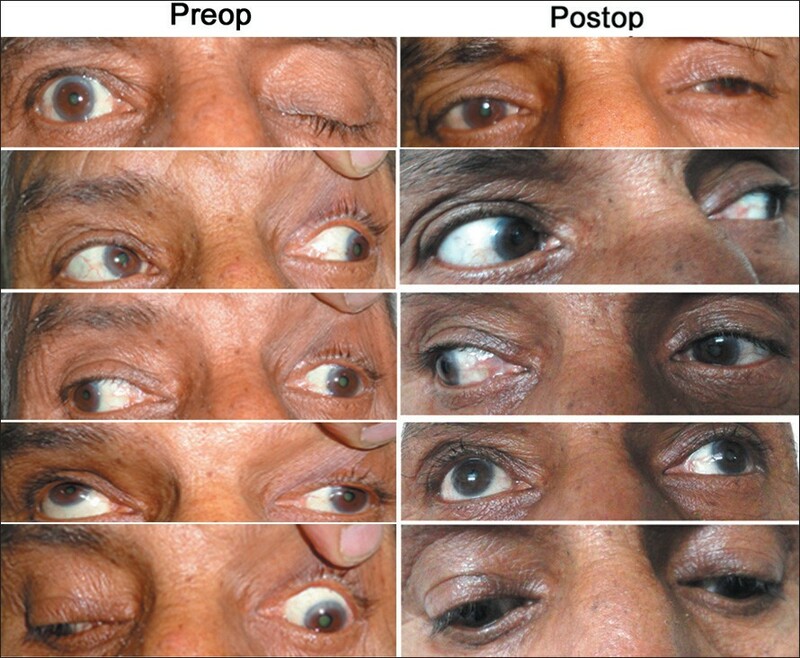 To the best of our knowledge, this is the second case of stroke associated with khat. Since the management is essentially conservative, a vigilant history eliciting of khat abuse in prevalent countries would cut down unnecessary healthcare costs. Scrub typhus is a rickettsial disease caused by Orientia tsutsugamushi, one of the most common infectious diseases in the Asia-Pacific region. It has been reported from northern, eastern, and southern India, and its presence has been documented in at least 11 Indian states. However, scrub typhus meningoencephalitis has not been well documented in Kerala. We report two cases of scrub typhus meningoencephalitis from northern Kerala. The diagnosis was made based on the clinical pictures, presence of eschar, and a positive Weil-Felix test with a titer of > 1:320. The first patient succumbed to illness due to respiratory failure and the second patient improved well. The long QT syndrome (LQTS) is a cause of syncope and sudden death. Jervell and Lange-Nielson syndrome (JLNS) is an uncommon form of LQTS, having autosomal recessive transmission, and is associated with congenital deafness. 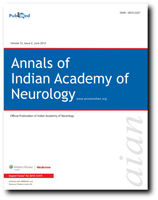 We report a case of JLNS in a child who presented to us with refractory epilepsy. The cardiac cause of seizures was suspected as the child was hypotensive and pulseless during the episode of seizures. The child was diagnosed as JLNS based on Schwartz diagnostic criteria for LQTS and congenital sensorineural deafness. The child responded well to β-blocker therapy. Antiepileptic drugs were stopped. The screening of family members with ECG revealed a QT interval more than required for diagnosis of LQTS but they were asymptomatic. All asymptomatic family members were also put on metoprolol. All of them showed great improvement with the reduction of the QT interval on ECG. The patient was doing well on immediate follow-up. In patients with central nervous system disease, life-threatening hyponatremia can result from either the syndrome of inappropriate secretion of antidiuretic hormone or cerebral salt wasting. Clinical manifestations of the two conditions may be similar, but their pathogeneses and management protocols are different. Cerebral salt wasting syndrome is a disorder in which excessive natriuresis and hyponatremia occurs in patients with intracranial diseases. 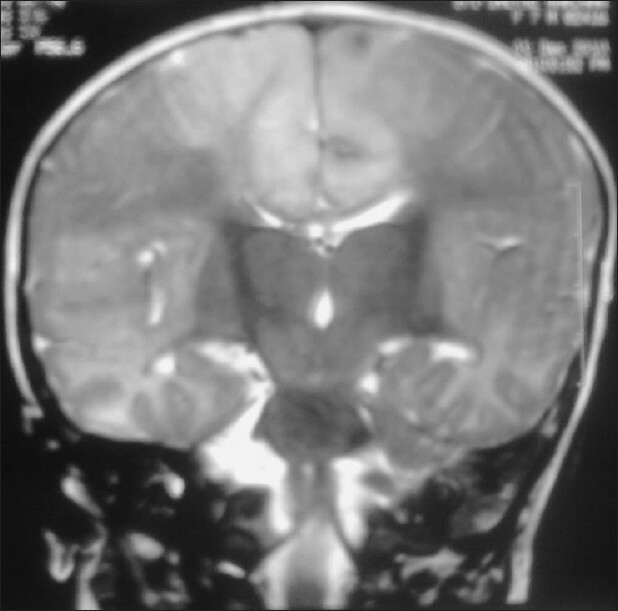 We report a 6-month-old girl with CSWS associated with tuberculous meningoencephalitis. She was diagnosed as having CSWS on the basis of hypovolemia, polyuria, natriuresis, and the relatively high level of fractional excretion of uric acid. Aggressive replacement of urine salt and water losses using 0.9% or 3% sodium chloride was done. Fludrocortisone was started at 0.1 mg twice daily on the seventh day of admission and was continued for 17 days. 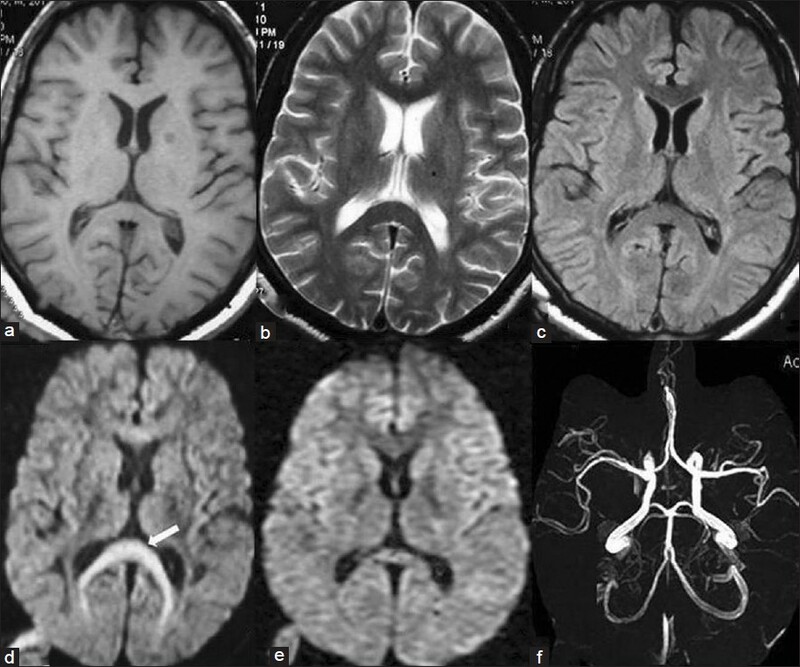 Transient signal abnormality in the splenium of corpus callosum on magnetic resonance imaging (MRI) is occasionally encountered in clinical practice. It has been reported in various clinical conditions apart from patients with epilepsy. We describe 4 patients with different etiologies presenting with signal changes in the splenium of corpus callosum. They were diagnosed as having progressive myoclonic epilepsy (case 1), localization-related epilepsy (case 2), hemicrania continua (case 3), and postinfectious parkinsonism (case 4). While three patients had complete involvement of the splenium on diffusion-weighted image ("boomerang sign"), the patient having hemicrania continua showed semilunar involvement ("mini-boomerang") on T2-weighted and FLAIR image. All the cases had noncontiguous involvement of the splenium. We herein, discuss these cases with transient splenial involvement and stress that such patients do not need aggressive diagnostic and therapeutic interventions. An attempt has been made to review the literature regarding the pathophysiology, etiology, and outcome of such lesions. Ophthalmoplegia due to 3 rd nerve palsy is a common occurrence, and is usually a sign of diabetes mellitus or a serious intracranial disease. 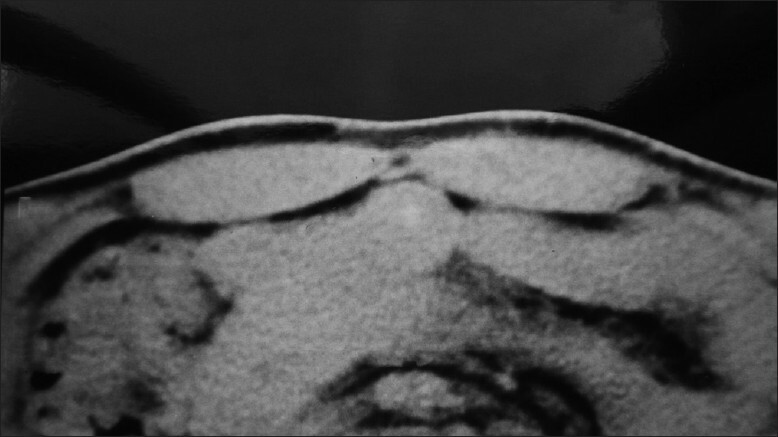 We report a rare case of pupil sparing 3 rd nerve palsy caused by mucocele of the sphenoid sinus. The patient regained 3 rd nerve functions after successful decompression of the mucocele. Early and correct diagnosis of this relatively benign condition is important to prevent permanent neurological deficits, including visual loss by optic nerve atrophy. Etiology, clinical manifestations and treatment of the sphenoid mucoceles is discussed and available literature is reviewed. Tuberous Sclerosis (TSC) is clinically marked by a triad of adenoma sebaceum, epilepsy and mental retardation. It can however manifest as various neuropsychiatric disorders. We report a patient who presented with TSC and co-morbid Obsessive Compulsive Disorder. Honey-bee bites which require urgent hospitalization is very rare. It is mainly seen as occupational hazards in farmers, tree dwellers and honey collectors. Common clinical presentation includes minor localized reactions in form of swelling and redness sometimes anaphylactic reaction. Infrequent major complications reported from different studies include rhabdomyolysis, acute renal failure (ARF), acute pulmonary edema, intravascular coagulation, encephalopathy and very rarely cerebral haemorrhage. Stroke due to multiple intra- cerebral infarcts along with rhabdomyolysis in patient of honey-bee bite is rare neurological complication. We report a case of 70 year man with honey-bee bite and multiple intracerebral infarcts presented as stroke, and rhabdomyolysis and ARF. 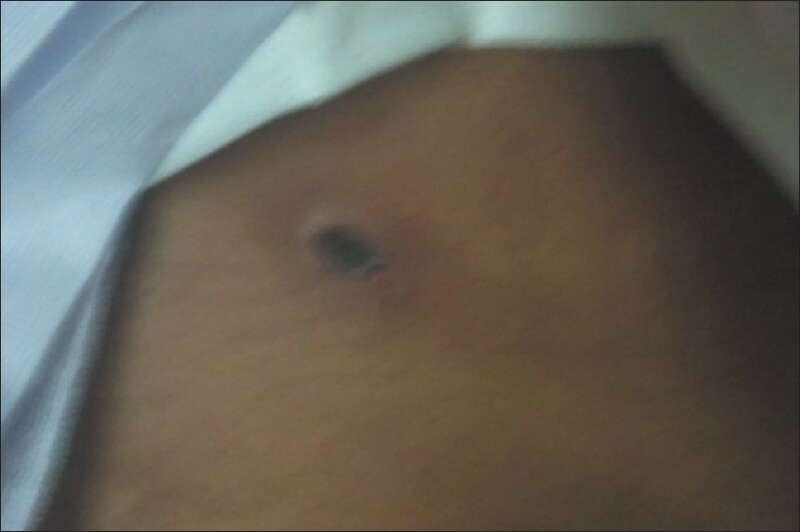 When a patient presented with honey-bee bite, one should suspect serious complications. Despite advances in the understanding of pathophysiology its complications remains enigmatic and in some instances may be multifactorial. Various therapeutic interventions if started early after diagnosis reduces the possible consequences as potential reversibility of the illness.